Cassettes could be the streamlined and space-saving solution you could usefully employ. A sector plate is easy - pivot at one end and a curve at the other so that the tracks line up with the receiving track. 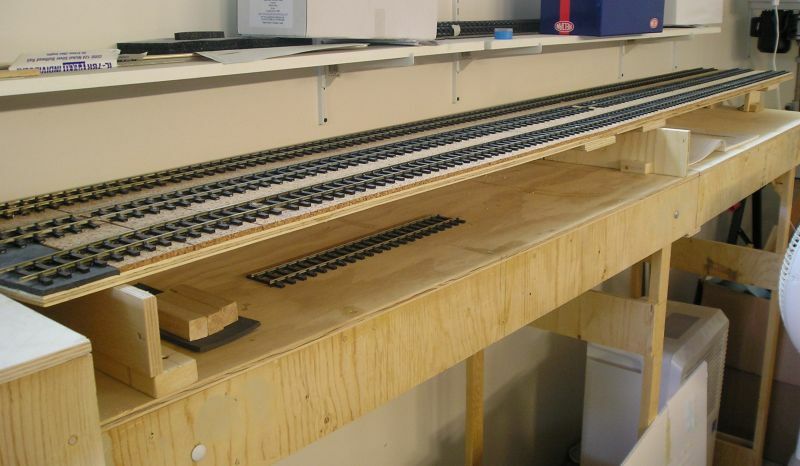 Mine is 7' long but for 4mm, 4' should be enough, but this depends on train length. The near end just slides on the ply. I could set up something fancier but I like simple. I made mine wide enough for three tracks. The tracks curve outward slightly so they are perpendicular to the end of the sector plate. If you do a point ladder you require more space because points take a lot of length. Hi John. Thank you. I must admit that you make it look simple. Best wishes Kevin. This sort of set-up is worth considering, and although a tadge more involved than cassettes could be used for any number of layouts. It gives you four lots of 3ft roads plus a centre run-round track in a 3ft - 11in space. If you choose to pivot the smaller table at its centre, you could turn tender locomotives off-scene. I prefer traversers they take up less room. It's only a 2 position one with two strips of hardwood at the centre and a strip attached to the plate itself. The groove is deliberately a bit wobbly and top and bottom there are two screws to make it line up with the adjacent tracks. The top and bottom tracks can be used for storage and the tracks on the right allow me to get to the back of the stock tracks. Once set up I don't have to take anything off the layout. I go to exhibitions and I have seen stuff dropped and one of those cassette thingies break and empty out onto (wouldn't you just know it) stone flags. The traverser surface is 5mm ply and there is a tongue and groove at each end, I use graphite as lubrication.